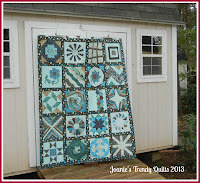 Quilting and Binding the Craftsy Block of the Month - Finished! 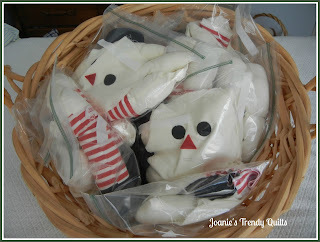 3 sets of Raggedy Anns and Andys each in a different size. Not Finished! The 25" set is completed but the 20" and 15" dolls are not. 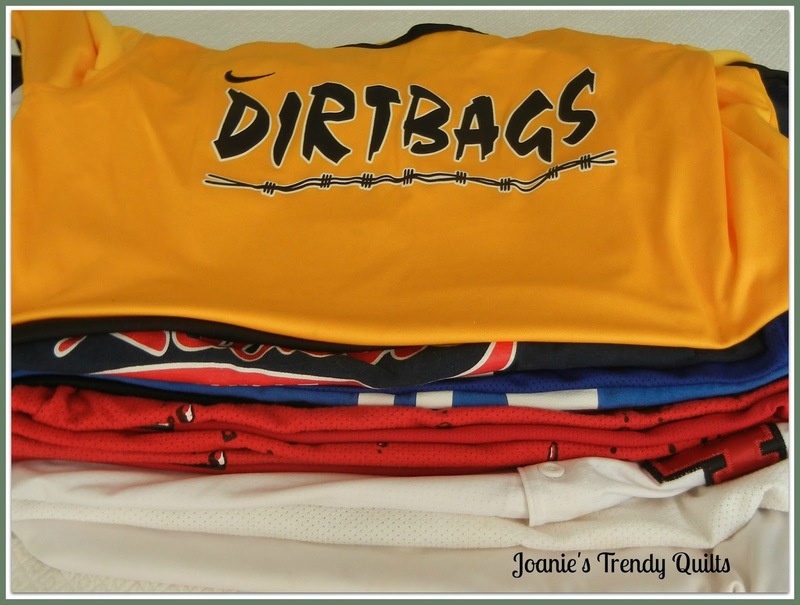 Clothes are ready for all sizes and more than planned. Complete Modern Stars quilt. 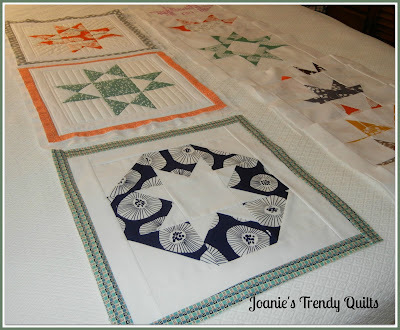 Blocks were won in a swap at the Charlotte Modern Quilt Guild about one year ago. Progress is in different stages. The first is testing how the Fun Done technique (QAYG) will look. I am overall pleased with the Fun & Done technique but will be ripping out one of the edges to straighten it up a bit. I used a steel spatula to iron the edges over. Not the most ideal tool to use so I will be making a trip to my LFS to purchase a light weight metal sleeve ruler hopefully today! Yesterday's accomplishments were sewing the inner white borders on the star blocks. Close up of two quilted blocks joined together. I am still debating whether to rip out the horizontal lines on the one star. It was an effort to differentiate these two Ohio Stars. I didn't take note that both of these stars were the same. All the other stars are different star patterns. 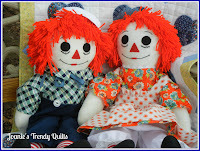 Complete 3 sets of 25" Traditional Raggedy Ann Clothes. Dresses are completed and one pair of pantaloons. 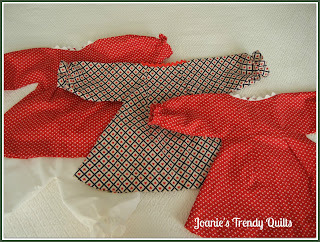 This will entail completing 3 aprons and 2 pairs of pantaloons. 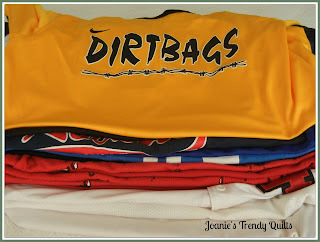 Cut baseball t-shirts and stabilize them. 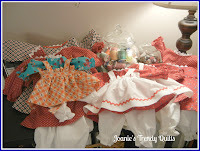 Most likely October will be a more reasonable time to complete the quilt top. Maybe so but at least something to shoot for! for hosting Lovely Year of Finishes! Their challenge does assist in getting those WIPs done. Though I didn't accomplish my August goals at 100% I am whooping it up with what I did finish! Not part of my goals last month but was accomplished!! - opening up My Etsy Shop. That is worth whooping up about since it has been one of those things I have been wanting to do. Thanks for visiting and looking in. Your "Craftsy" sampler is a grand finish for the year, good for sticking with it! I'm wishing you success in your list, and congrats on the Etsy shop! Love how the modern blocks are turning out. I like the different quilting. Wait till they are all done and laid out before you start ripping. I like the quilting on your blocks. Don't rip out anything :-) Good luck with your goal. Your Craftsy sampler looks great! Congrats on your finishes and your Etsy shop! I think I might do one of those eventually:) Loving the sampler and your stars. I would love to know your final thoughts on the QAYG once you are done...I haven't tried this yet. I don't see why you need to do any ripping. Looks great. I love your dolls! When I was little I had a giant set of them that I loved. My cousin and I wore their outfits for halloween the year we were 2. I wish I had a little girl to buy them for! I might have to get an Andy! Also, love what you've done with your stars blocks. I won the other set of them and they are still in a ziploc! Can't wait to see it finished, hope it will motivate me to put mine together! your turquoise quilt is gorgeous. Looks like you will be working on some great projects for September. What an impressive list - you've done so much!! Love those QAYG blocks! Whooping It Up Week! A Give Away to Celebrate!